Indian democracy was not confined to PM Modi and Rahul Gandhi: Asaduddin Owaisi. “We lack a true Opposition party. Why we should think about only Modi and Rahul for the PM’s post? There are many politicians in regional parties who are more capable than Modi and Rahul. I am not advocating that KCR should be Prime Minister, but in my view he has the ability to lead the country in a new direction, he said. 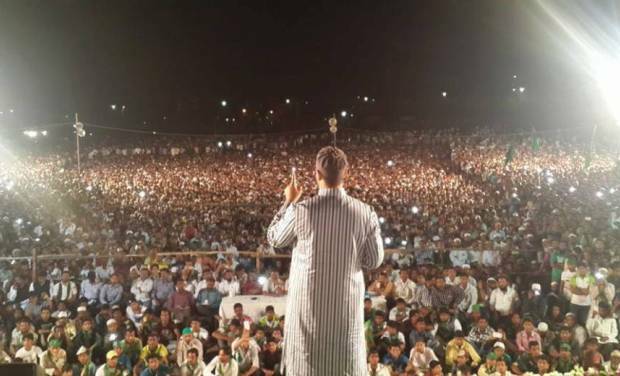 Addressing a meeting at Moghalpura, Mr Owaisi said Mr Modi was posing as a “chowkidar but was silent when his disciples attacked the house of Sameera in Gurgaon. “A mob attacked a house with a Tricolour flying on top, shouting ‘go to Pakistan’. The girl was crying and seeking help but no one came to rescue them,” he said. Mr Owaisi said Mr Modi had claimed in the context of the terror attack at Pulwama that “Hum ghar mein ghus kar marenge (we will enter their houses and go after them) but his disciples were barging into the house of an Indian.” He asked whether Mr Modi had the courage to condemn this incident. The Prime Minister did not even tweet on this incident, he lamented. Mr Owaisi said Congress leaders were quitting the party and asked who was responsible. “Liberal and so-called secular people are targeting me for not supporting the Congress, but they have to ponder over whether the Congress has the ability to grab 120 seats. It is our dream that the next Prime Minister should not be from the BJP or the Congress,” he said. Mr Owaisi said Mr Modi had to answer about the decision regarding firing missiles at Pakistan on February 27 as reported in a section of the media. He asked why the Centre had discussed the matter with US National Security Adviser, US secretary of state Mike Pompeo and the ISI and did not inform the Opposition parties.